For complete estimating and costing solution of a construction project we always use computer aided software like Contractor’s office. It is time-saving and accurately deliver us what we want. But for our day to day construction activities, we always do this manually on the project to find the required materials for our tasks. In this post I’ll show how you can estimate the required reinforcement for neck column in 8 easy steps. As we know a neck column has two types of bars. One is longitudinal bar and another is stirrup. Longitudinal bars are those which are vertically places in column and stirrup are those which are horizontally provided around longitudinal bars. So we’ll estimate both types of bars in following 8 easy steps. Let’s start with the longitudinal bar first. Summarise the numbers of same diameter bar separately. See the image below. There are different diameter of bars in the column section. It is not practical to place the longitudinal bar more than 20′ long. Another thing to consider is that the full length of a bar is about 40 feet. If you cut them at middle you’ll get 20 feet long bar. So the length of longitudinal bar for the neck column is 20′. To find the total length of longitudinal bars multiply the length of each bar with the total number of bars of same diameter. To calculate the weight of bar you should know the unit weight of different diameter bar. Read the following post to know how to calculate the unit weight of steel reinforcement. 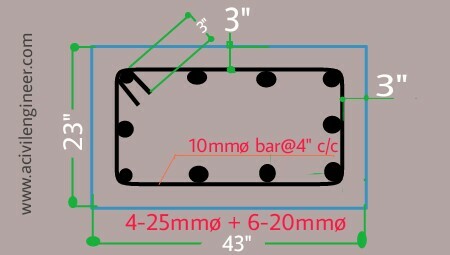 20mmø bar = 0.750 kg/ft. Now multiply the total length of bar with unit weight to find the total weight of bar. 25mmø bar = 80 x 1.172 = 93.76 kg. Say, 94 kg. 20mmø bar =120 x 0.750 = 90 kg. Now let’s move for estimating stirrups of neck column. To find the number of stirrup you need to know the length of neck column and the spacing of stirrups. The length of neck column is the distance between the top face of footing and the bottom face of grade beam. Let’s assume, neck column length is 5′. We can find the stirrups specification from the above image. That is 10mmø [email protected]″c/c. Now divide the neck column’s length with the stirrup’s spacing. The neck column size we found from the above image is 43″ x 23″. That means, the length of column is 43″ and width of column is 23″. If we deduct the concrete clear cover from both side, the length of stirrup will be 43″-6″= 37″ and width is 23″-6″=17″. 2 x length of stirrup + 2 x width of stirrups + 2 x hook’s length. To calculate the total length of bars multiply the numbers of stirrups with the bar length of a stirrup. To calculate the weight of stirrup’s bar just multiply the unit weight of 10mmø bar with the total length of stirrup’s bar. Weight of stirrups bar= 152 x 0.188=28.58 kg, say 29 kg. If you have any query about this post please share in comment below. Subscribe to our newsletter and get a free "estimating Cheat Sheet"
What Is The Standard Size Of Doors And Windows In Residential Buildings?